Breakfast is the first meal of the day .The French toasts are so delicious , stuffed with Nutella and Strawberries, you can use any of your choice stuffing . Nutella is ultimate winner with these rolls it just melt in your mouth. Strawberry Nutella French Toast Roll Ups are quick, delicious and easy to make , perfect way to start your day! This French toast is great combination of strawberries and Nutella. I like to make this for special Friday mornings. When you wake up late, drink your cup of coffee and this is right choice for you. 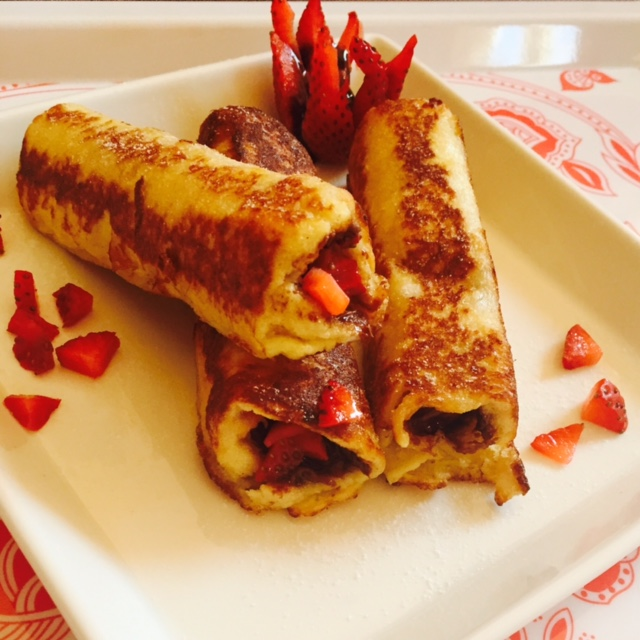 Strawberry Nutella French Toast Roll Ups are amazing breakfast Idea for your family on Weekends. They are so soft and gentle and everything you need is your favorite fruit and Nutella. To make this Strawberry Nutella French toasts rolls is something very easy. They are perfect for snack, breakfast , dessert or even kids tiffin food.I usually make it sweet and chocolaty version with Strawberries but you can try it without strawberries or even with your choice of Fruit. It tastes amazing and the look is beautiful too. They are soft inside and outside crispy golden brown. Strawberry and Nutella is classic combination with its luscious taste. This recipe is really one of the best recipes . Sweet and creamy happiness filled with Nutella and Strawberries .You can decorate them with chocolate syrup or with Classic golden syrup. Cut crust from each slice and flatten it with rolling pin ,spread Nutella over bread slice with diced strawberries ,roll the bread up tightly. In a bowl whisk egg milk and thick cream until combined add drops of vanilla and sugar. Heat a pan and melt a tbsp of butter Now dip each bread roll in egg mixture coating well then place them in the pan cook until golden brown. Stay connected with all my foodie post on Facebook and Instagram.